The death toll from one of the worst forest fires to hit Chile has risen to at least seven, as the South American country tries to battle the flames. Several communities in the Maule region have been decimated, with more than 1,000 buildings destroyed in Santa Olga. Officials revealed the body of one person had been discovered under the ashes of the town, as around 6,000 residents fled Santa Olga unharmed, ABC reported. "This is an extremely serious situation of horror, a nightmare without an end," Carlos Valenzuela, the mayor of neighbouring Constitucion said. "Everything burned." At least four firefighters have been killed as they battled to control the flames. According to The Guardian, drone images reveal the extent of the damage. Entire neighbourhoods have been reduced to ashes. 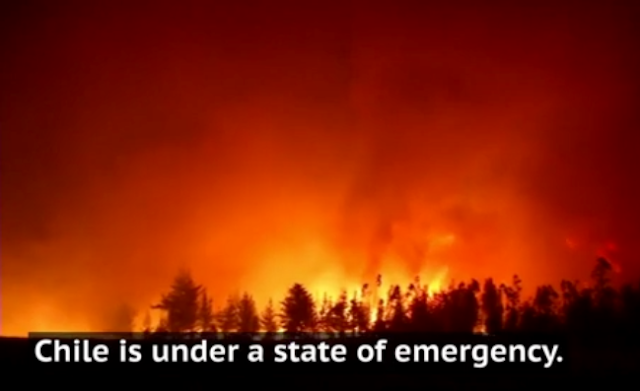 Unseasonably high temperatures have allowed more than 90 wildfires to break out and spread. "Nobody can imagine what happened in Santa Olga. What we have experienced here is literally like Dante's Inferno," Valenzuela said. "We were recovering after the last earthquake, but this tragedy has messed up everything." The mayor said that similar destruction had been seen in the smaller communities of Patú and Cabezalillo. Andrea Munoz, the governor of Concepcion province, added authorities found another body burned inside a home destroyed by the flames in Concepcion—140 km (140m) south of Santa Olga. The sheer scale of the destruction has blunted the effectiveness of the relief effort, with civilian organisations filling in to help save lives. Francisco Henríquez, director of the civil organisation Orca Chile deployed in the area, called the destruction "awful". "It's the worst catastrophe we've had in a number of years. I believe that this surpasses any tragedy that we have had before, this is much worse than when it was the earthquake or the floods. It is a thing that does not stop, is advancing," he said. Many residents have expressed frustration over the government's response to their situation. "When the politicians need our votes they come here, they put their face and expect us to vote for them. Now they're not here," Santa Olga resident Miguel Reyes told BioBioChile. Interior Ministry Undersecretary Mahmud Aleuy warned that more fires may break out due to continued high temperatures, strong winds and low humidity. Authorities have also promised to investigate the cause of the fires and launch an enquiry on how effective the official response was. According to 24Horas, Interior Minister, Mario Fernández, confirmed that five people had been detained in connection to the fires. The four are from Chépica while the fifth person is from Linares. The National Forestry Corporation reported that 238,000 hectares of forests in central and southern Chile have been burned, causing damage to farms, vineyards and cattle ranches. President Michelle Bachelet declared a state of emergency and called for international help to battle the blaze, the Guardian reported.